Educating, Inspiring, and Serving Since 1995. We provide training, coaching, and consulting that enable executives and business owners to make better decisions regarding their people challenges. Workplace, Productive Conflict, Work of Leaders, Sales, Management, 363 for Leaders, and MyEverythingDiSC.com are all important programs within the Everything DiSC suite. 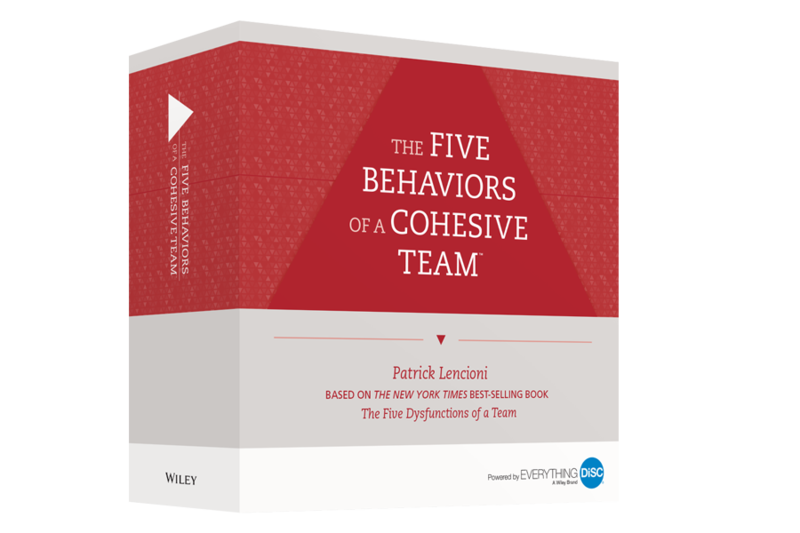 THE FIVE BEHAVIORS OF A COHESIVE TEAM™ helps individuals and organizations build truly cohesive and effective teams in the most effective way possible. Powered by Everything DiSC® and All Types™, the profiles help participants understand their own DiSC® styles. Learn how to build truly cohesive teams with a powerful assessment-driven learning experience that is based on the best-selling book, The Five Dysfunctions of a Team, by Patrick Lencioni. The program is called The Five Behaviors of a Cohesive Team. The five behaviors are: trust, conflict, commitment, accountability and results. Experience the free one hour webinar, sign up now! Training Solutions, Inc. is an Authorized Partner for the programs below. We hope that you review these featured products for use in your organization to bring improvements in your workforce and workplace. TRAINING SOLUTIONS Inc. provides interactive classes to keep your employees motivated as they learn people skills in a supportive environment. TRAINING SOLUTIONS, Inc. offers this cloud-based library with video vignettes, complete programs, training activities, eLearning programs and more. TRAINING SOLUTIONS, Inc. offers online products and services that will help HR professionals with hiring, retention, coaching and development plans. TRAINING SOLUTIONS, Inc. offers confidential executive coaching services that are customized to best fit the needs of each participant and can include a 360 feedback process. PXT Select™ makes the very human decisions about hiring simpler and smarter giving hiring execs insight into candidates' cognitive abilities, behavioral traits and interests. TRAINING SOLUTIONS Inc. is certified in Everything DiSC®. If you are an internal trainer, you also can be certified in this program. TRAINING SOLUTIONS Inc. is certified in The Five Behaviors of a Cohesive Team™. If you are an internal trainer, you also can be certified in these programs. TRAINING SOLUTIONS, Inc. offers confidential executive coaching services that are customized to best fit the needs of each participant.